Cab back to Vdara and lights out! Day 4: We woke to the quiet of the Canyon, before the large groups started to enter the area. Guess what was on the breakfast menu? The last of the breakfast food we got at Whole Foods! That one stop saved a lot of time and money! The last of our items got packed, brought out to the front of El Tovar, and I went to pull the car around. We loaded up the suitcases, and then still couldn’t quite bear to leave. All of us walked the few feet back to the rim and stood looking out one last time. And two of us might have cried in the car. Just sayin’. 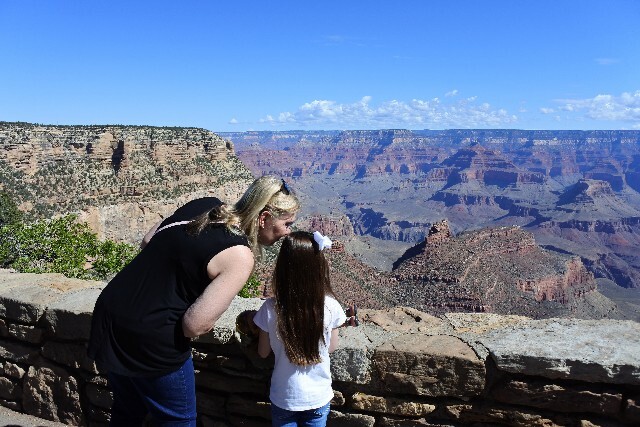 We were facing about a four-hour drive to Hoover Dam via the western route out of the Canyon, so it was important for us to be on the road before 10am. From there it would be another hour into Las Vegas. The biggest town on the way to Hoover Dam based on the trusty paper atlas was Kingman, Arizona. I also had purchased Next Exit, which provides a list of services available at each interstate exit. My mom was able to look up safe food options for Elizabeth in Kingman. 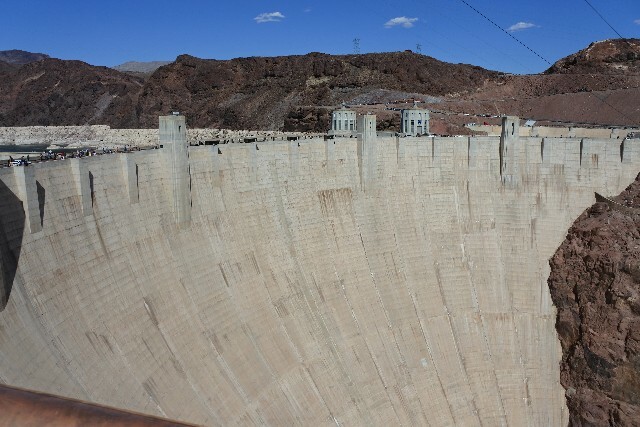 From Kingman to the Hoover Dam is supposed to take about 1 hour and 15 minutes. On the Friday of Memorial Day weekend it took just a tiny bit longer (please note the sarcasm). In fact, just getting from the expressway exit to the Dam was bumper to bumper. The parking garage is a left-hand turn into a poorly marked entrance. We missed it the first time, had to crawl across the dam in traffic, and quickly three-point to go back across the dam to tour parking lot. Once you are in the parking lot it is easy to find a space and the entrance. 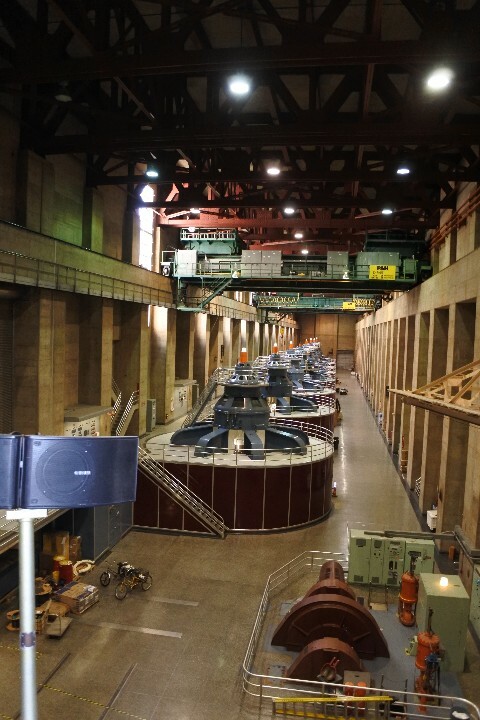 We elected for the Power Plant Tour which allows you to see a video about how Hoover Dam was built, take an elevator down into the power plant area for a brief tour, and then you can explore exhibits and observation deck at your leisure. We spent about an hour and a half total visiting Hoover Dam. We could have easily spent more time, but we still had at least an hour of driving ahead of us before reaching Las Vegas. So some genius planned this trip to arrive in Las Vegas, by car, on the Friday of Memorial day weekend. Traffic was challenging getting into town, but was not as terrible as I had feared on the Strip. 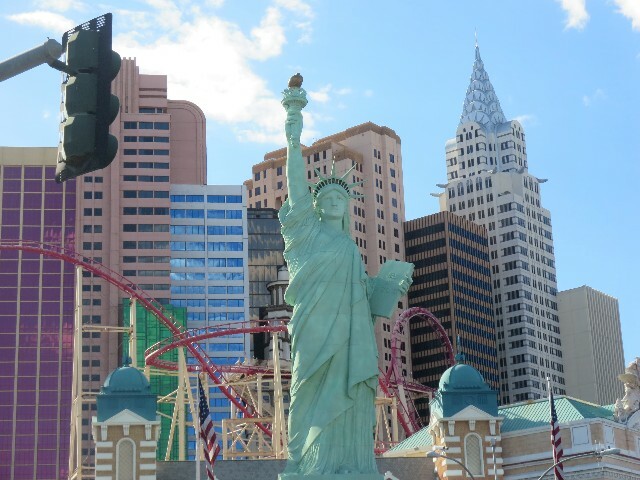 My mom and I have both been to Las Vegas before, but it was Elizabeth’s first time. So we did the essential tourist thing and stopped at the Welcome to Las Vegas sign on the south end of the Strip. Funny thing about the sign is that you see it going north on the Strip toward the hotels, but the only entrance to parking is on the southbound lanes of Las Vegas Blvd. We took a couple of side streets to go back south and into the lot. There was a huge wedding party and several tourists, but the line moved quickly. If you want everyone in your party in the picture you have to rely on a stranger to help. The group in front of us was happy to help, but the picture didn’t turn out the best. I wish I had taken at least one or two myself of just my mom and Elizabeth. Hopefully you will learn from my mistake! After this we headed up Las Vegas Boulevard toward our hotel, Vdara. I travel to Las Vegas at least once a year and figured finding hotel self-park would be a breeze. Hubris comes before a great fall. You access Vdara through Harmon like you would go to Aria, but there is only valet parking at Vdara. The valet is complimentary, except for tip, but since I had thought we would gather items in the privacy of the parking garage I was a bit embarrassed by the state of the trunk when the bellman came to help with our luggage. Check-in was a breeze since they had an online check-in process I completed before we left the Canyon. Fast check-in was a relief since after the serenity of the Canyon, Las Vegas on a Friday night was a bit jarring for everyone. We went to the room, called to have bags delivered and scoped out the room. It was pretty amazing. 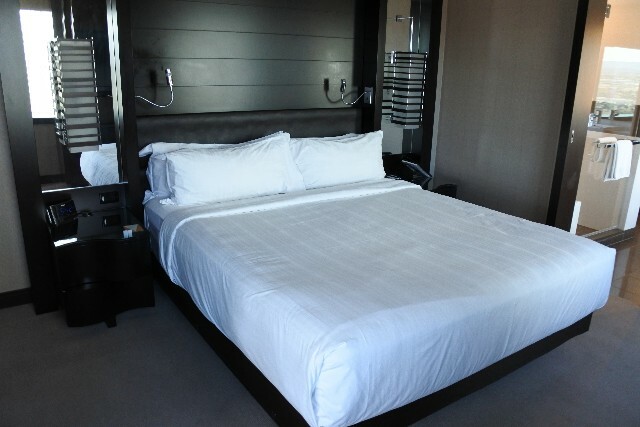 And because it is Las Vegas, this amazing room was not the most expensive one of the trip. 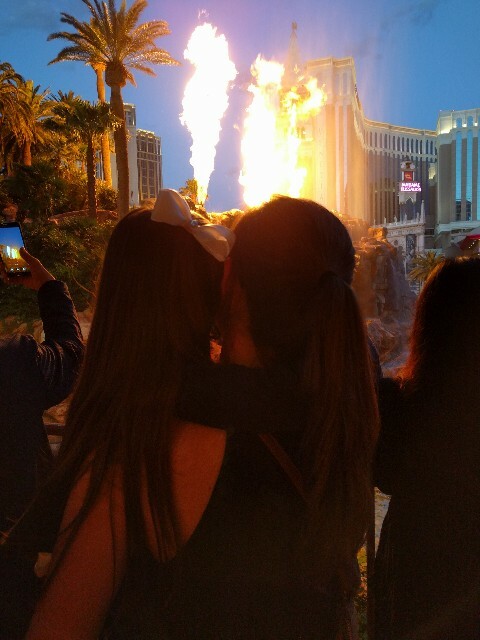 I had chosen Vdara because it did not have a casino (only a couple tame looking bars and restaurants), which since I have a 7-year-old girl was very important to me. 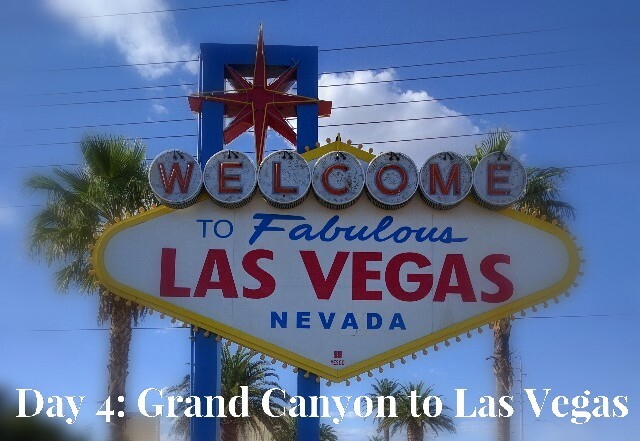 When I had visited Las Vegas last summer with my husband I had carefully curated a list of hotels and sights I felt comfortable taking her to visit. We unpacked a little and then decided to take a cab to Venetian for dinner at Yardbird. I had previously been there and knew that their delicious fried chicken would be a hit for all of us. My mom had made 7pm reservations on OpenTable on the way into town and we got there a few minutes early. 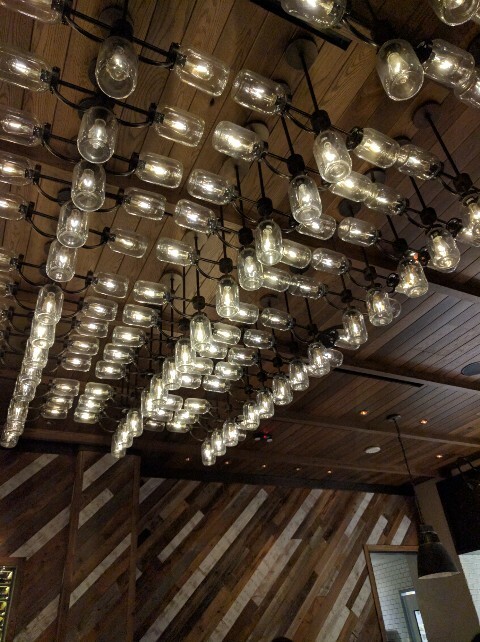 Love the light fixtures at Yardbird! We were seated promptly, ordered and had our piping hot food at the table before the drinks even arrived. This was fine with us. Warning – food at Yardbird is delicious, but since it is Las Vegas you never know quite how loud the other diners will be. After finishing dinner we headed up from the Venetian casino level to the Grand Canal Shoppes. The shops look like they are outside and the ceiling is painted to look like sky. Elizabeth loved it the minute she saw it. 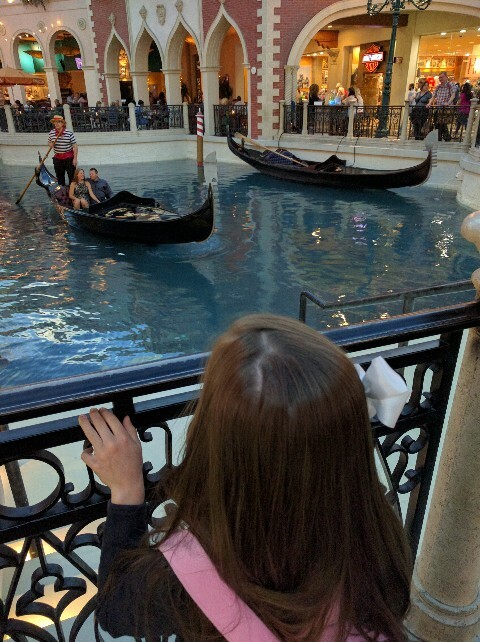 Then I walked her toward the gondoliers, who sail real boats on an indoor river, stopping at the “Statue” on the way. I gave her some money to tip the human statue, who I always appreciate. If you asked me to be one of these statues I know that in 5 minutes I would have a terrible itch on my nose or sneeze and be promptly fired. The statue very slowly indicated that Elizabeth could join him on the platform. She was so excited and went right up for some pictures. After this we walked the few steps to the canal to see the gondoliers sing while they pilot the boats. Again, open mouth stares from her. Next up, we walked across the street to visit Mirage. Mirage is a favorite of mine and my husband. It was the first resort we stayed at in Las Vegas after we were married. It is has a great tropical theme, a signature scent and overall cool atmosphere. Behind the check-in desk at Mirage there is a large aquarium so we stopped to take a look. Next up we walked through the ‘rainforest’ – an area of lush tropical plants between the outside entrance and casino. Now it was time to hustle outside. There was only a few minutes until the volcano erupted. We squeezed into a small opening where I could pick up Elizabeth for her to have a great view just before the show started. We were so close we could feel the heat from the fire jets around the volcano. After the show we grabbed a cab back to Vdara and headed to bed. Grand Canyon in the morning, Hoover Dam and now Las Vegas. It had been a busy day!